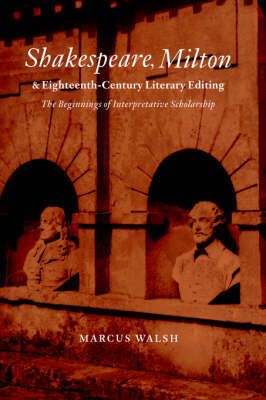 The first developments in the editing of English literary texts in the eighteenth century were remarkable and important, and they have recently begun to attract considerable interest, particularly in relation to conditions and constructions of scholarship in the period. This study sets out to investigate, rather, the theoretical and interpretative bases of eighteenth-century literary editing. Extended chapters on Shakespearean and Miltonic commentary and editing demonstrate that the work of pioneering editors and commentators, such as Patrick Hume, Lewis Theobald, Zachary Pearce, and Edward Capell, was based on developed, sophisticated and often clearly articulated theories and methods of textual understanding and explanation. Marcus Walsh relates these interpretative theories and methods to seventeenth- and eighteenth-century Anglican biblical hermeneutics, and to a number of key debates in modern editorial theory.